On Saturday 12 November the Bonfire Boys flag will fly over the Landgate as it has done so many times in the past. It is hoisted before dawn so that Ryers can see it announcing the big day in the Bonfire Society year from first light. An air of expectancy will hang over the town throughout the day until seven o’ clock when a maroon will burst high in the sky signalling the start of the torchlight procession which will leave Tilling Green and proceed along Ferry Road and Cinque Ports Street to the Landgate Tower. Bonfire Boys marshalling the procession will be hoping that there will not be a recurrence of last year’s embarrassment when the tableau depicting the stranded coaster ‘Maanav Star’ got stranded itself under the arch. From the Landgate the cavalcade will make its way up Hilders Cliff, proceed along the High Street and down The Mint, turning right to rejoin Cinque Ports Street again, then a final trek down Landgate and Bedford Place to The Bonfire Salts where the Societies will gather inside the perimeter fence to wait for the arrival of Rye Fawkes 2005. Who will be Rye Fawkes 2005? This is a closely guarded secret that even “Rye’s Own” is not privy to until the last minute but this does not stop speculation. Might there be two figures riding on the chair? Could Rye’s own pop duo The Cheeky Girls break the tradition of the ages and become the first duo to light the fire? Maybe it will be a political figure or one of the many famous film stars, television personalities or musicians living in the area. Paul Macartney springs to mind. It could be that the Mayor of Rye will do the honours, no one knows except the executives of the Rye Bonfire Society. Whoever it is that rides on the shoulders of Rye’s finest firefighters it is certain they will experience a a journey they will never forget. After the bonfire is lit there will be a display of pyrotechnics the like that Rye has ever seen. The cascade of colour and sound will astonish even those that witnessed the great displays of the Millennium. From the days when Rye Burned its Boats. A wealthy resident in the High Street declined to subscribe to Bonfire Funds. On the great night a blazing boat was hauled through the town and broke adrift immediately outside his newly painted house. Unfortunately, the heat was so great that a chain could not be affixed and the boat was left to burn out. It is understood that he became a regular subscriber in after years. A strenuous police effort to prevent the usual passage of a burning boat resulted in a cry for water. A bucket was hastily produced and the contents (paraffin) thrown on the flames. In former days, six special constables were sworn in for “the fifth.” Four played cards and two kept a look-out for the regular police. November 3rd. 1946. The fireworks for Rye had been lost in transit – In reply to frantic phone calls, a duplicate set was sent by road in time for the 5th. 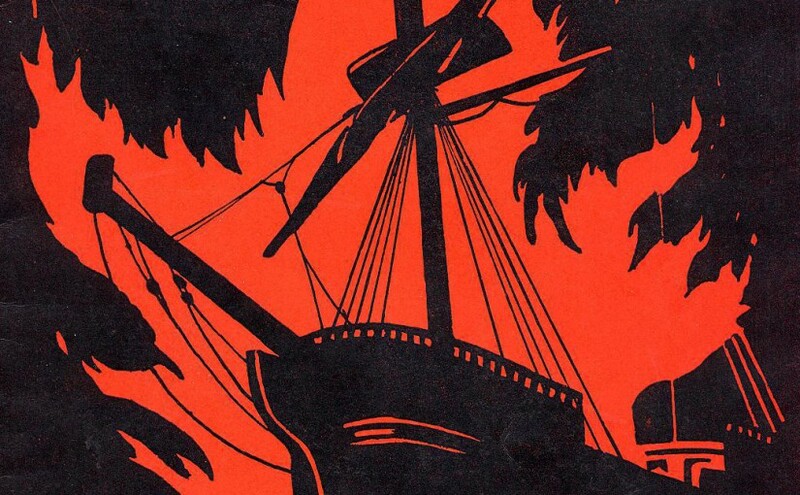 The famous Burning Boat emblem that appears on the programme each year was designed by Mrs. Mackehnie in 1946. British soldiers used captured German fireworks for a “Victory” display at the end of the War. A rocket containing thousands of Swastikas was NOT used. Guy Fawkes came from a respectable Yorkshire family, his father was a Notary at York and Registrar and Advocate of the Consistory Court of the Cathedral. The date of his birth is unknown – his death 1606.